Artist statement: The creative process can be thought of as a spiritualOne. 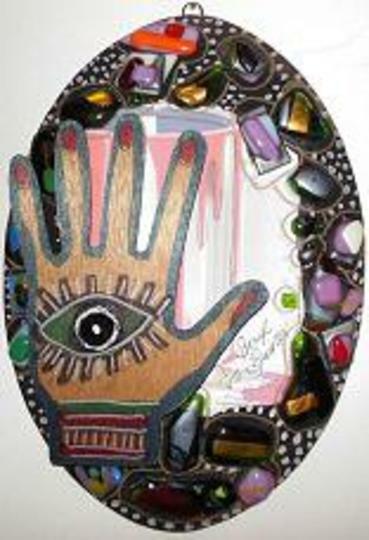 The piece shows a “Hamsa” (hand that blesses) blessing a can of paint. I really enjoyed the prospect of participating in a project that connects artists from all over the world. I found this to be very challenging. Every nation has its own culture but art, all art, stems from the soul of the person who creates it. It is this act of artistic creation that unites all artists the world over regardless of the nation that they come from or their gender or their age or their politics or their religion or what they look like. In addition to being a professional artist, I work in a profession that permits me to study and interpret art every day of my life. Therefore I am quite accustomed to doing so and I really enjoy the process so I did not find this to be difficult. I enjoyed the premise of the exercise and can’t wait to see the final result. Thanks for letting me be part of it.